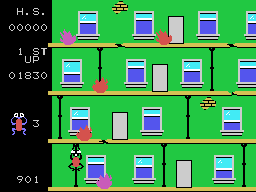 A tall building is on fire, and while all the human inhabitants seem to be safe, their cats are trapped in the flames. It is up to the brave fireman Frantic Freddy to save all the cats, floor by floor. 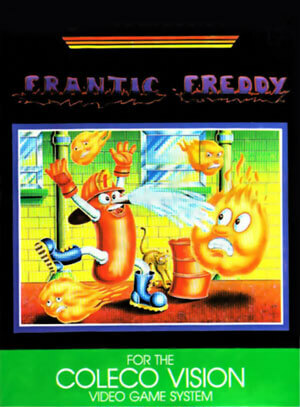 Frantic Freddy is an arcade action game where Freddy must run back and forth on the ground, dodging falling rubbish while shooting water at flames in the windows of a building. 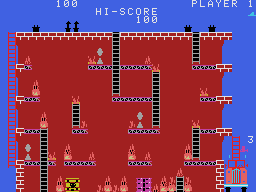 When all fires are extinguished, the game progresses to the next floor, where Freddy can climb between the floors, shooting to the left and right instead of upwards. On these levels, there are two kinds of flames – the red and the purple ones. 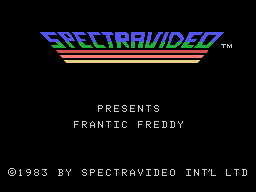 The purple ones are more aggressive, following Freddy around the screen, and can only be put out once all the red ones are extinguished. 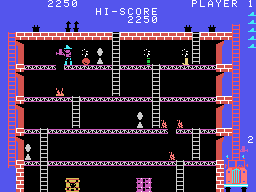 The game progresses in this way, alternating between the upwards-shooting levels and the sideways-shooting levels. On the higher difficulty levels, cats turn up at intervals in the windows, falling down after a while. Freddy must catch the cats, or he will lose a life. Similarly, he loses a life if hit by a fire or falling rubbish.